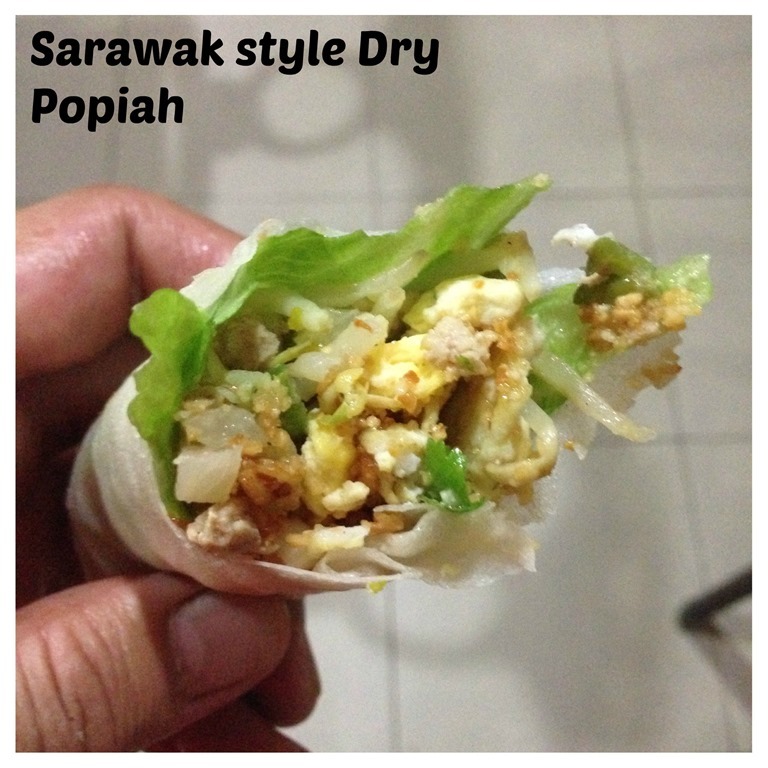 As this is an very old post, I have decided to prepare some Sarawak Style dry popiah and do some picture shooting. Being one of the very first post of this blog, the pictures were not well taken. 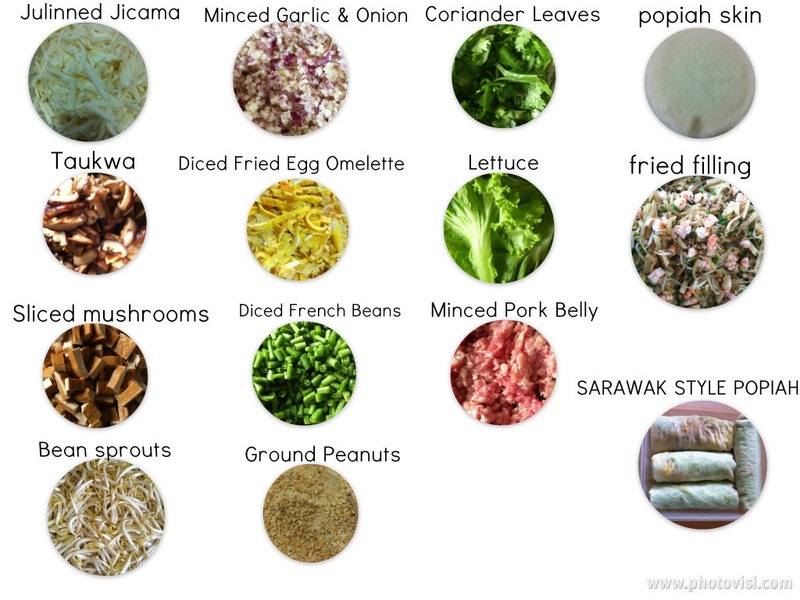 First and foremost, I have to qualify that the name Popiah – Sarawak Style was used because it is different from the popiah that I have eaten in West Malaysia and Singapore. 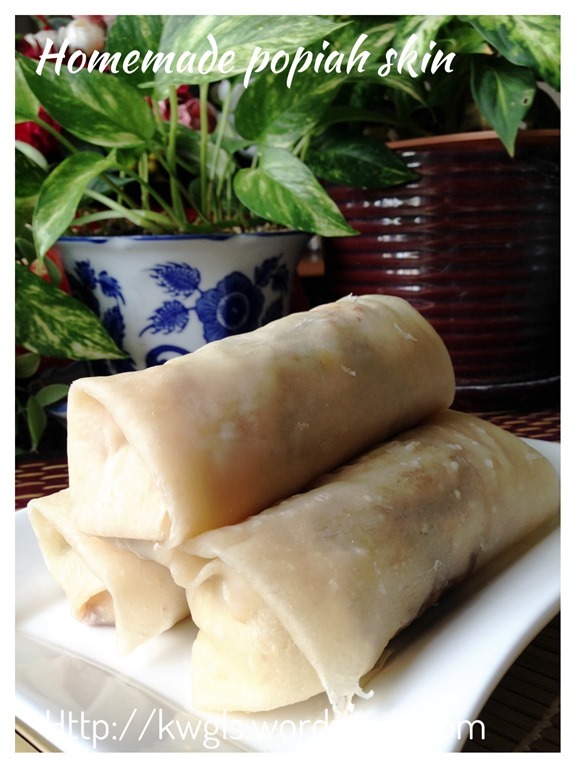 What I have cooked and written here is based on my memories that my late mother have prepared for us and the type that were commonly sold in the “kueh” stalls in Kuching about 20 years ago. 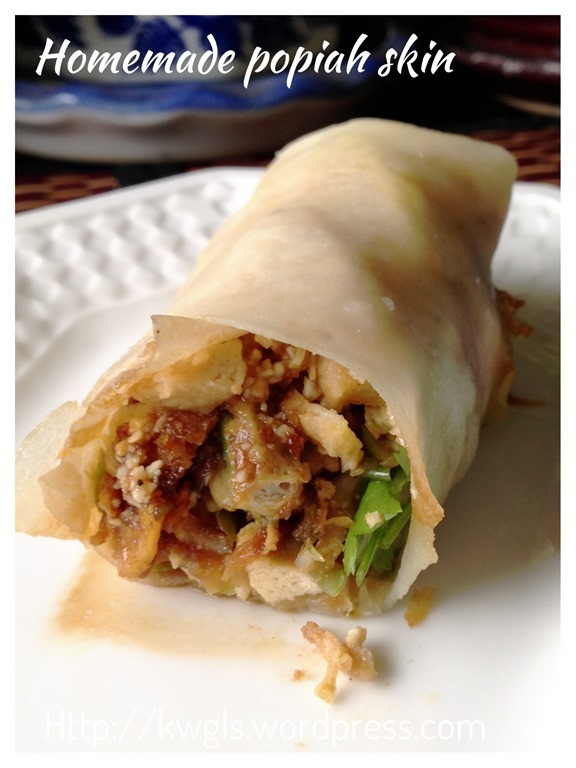 We can easily buy popiah together with other Kuehs such as curry puffs, fried bananas, angku kueh etc. as breakfast items. It is prepared in advance and not the type that they only wrapped it when you order as commonly found in the food courts or hawker stalls. 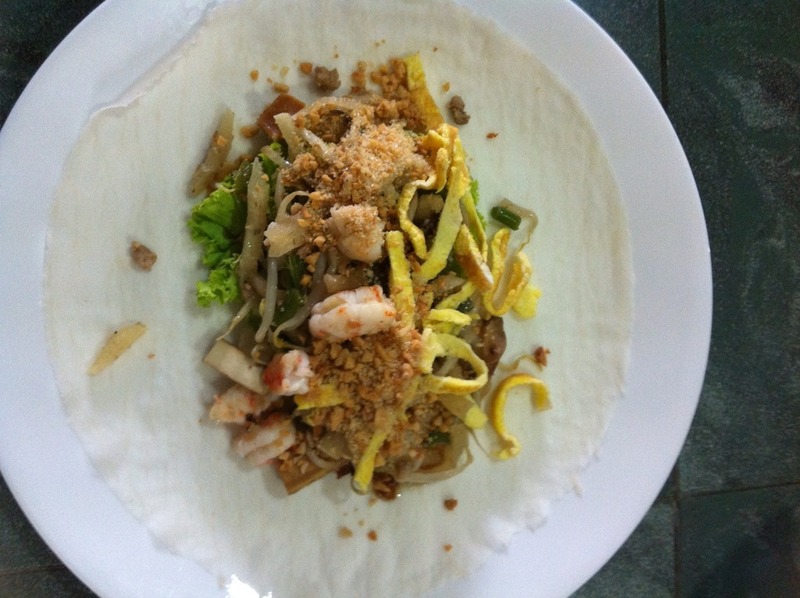 The hawkers who sell the popiah usually did not prepare the Popiah on the spot. 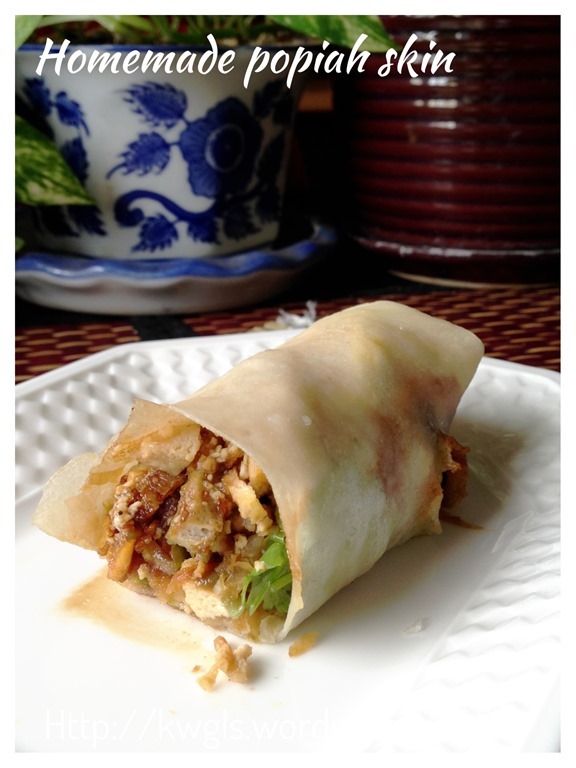 However, I am uncertain if this type of popiah is still common among Kuchingites but internet research shows not many bloggers talking about this version of popiah (presumably out-dated). 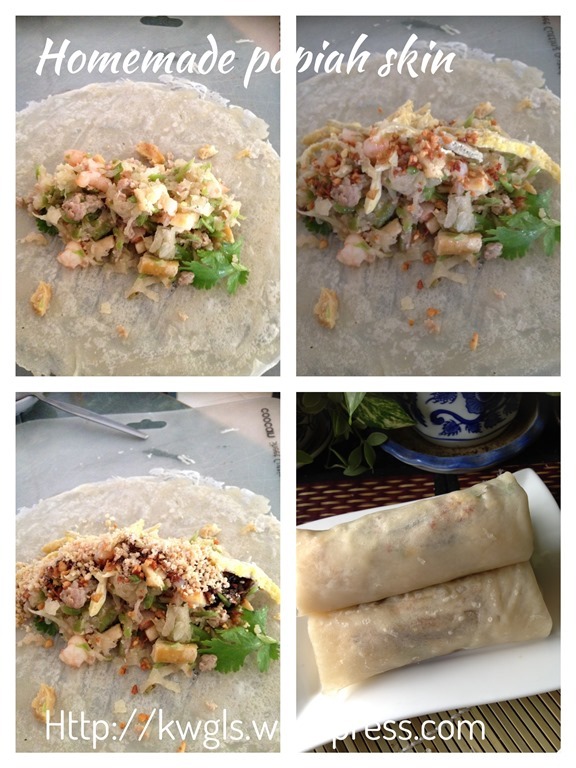 However, I still insist to prepare popiah in this manner as it is easier to prepare and store (if you cannot finish) and personally more tasty and less soggy.…. 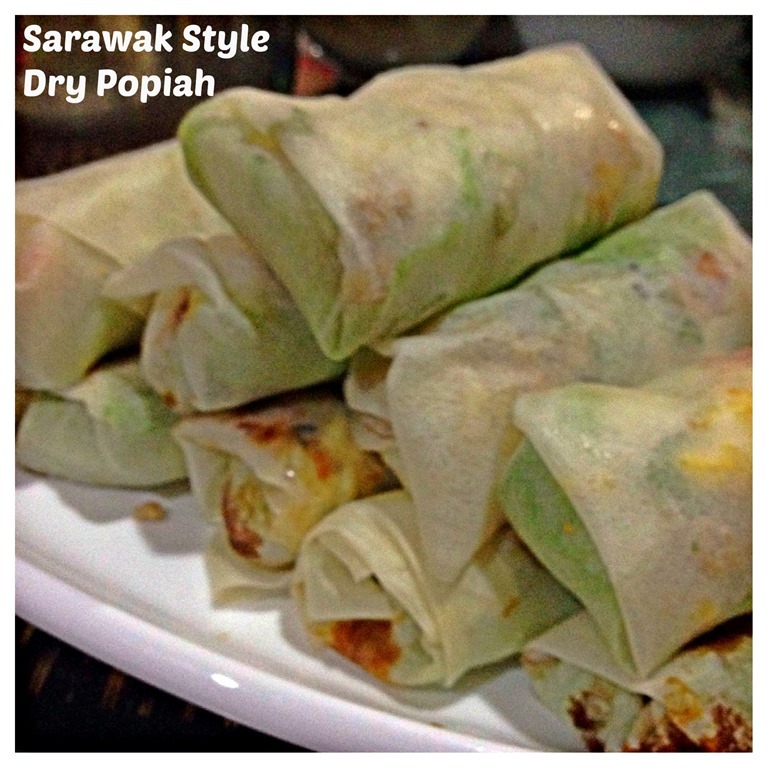 So, what is so different about my Popiah Sarawak Style. Frankly, not much difference except once critical process of preparing the jicama filling. Instead of simmering the cabbage and jicama in prawn soup etc. 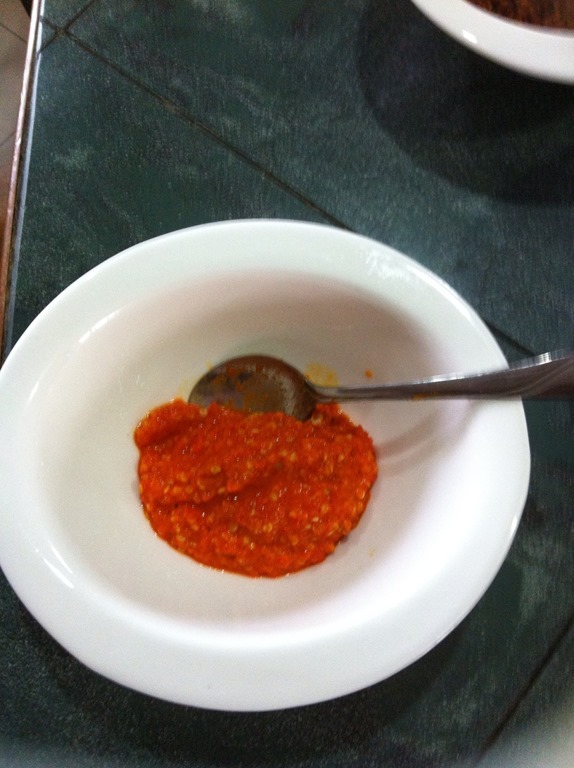 as in West Malaysian/Singapore style, we fried it and therefore I termed mine as the dry version. 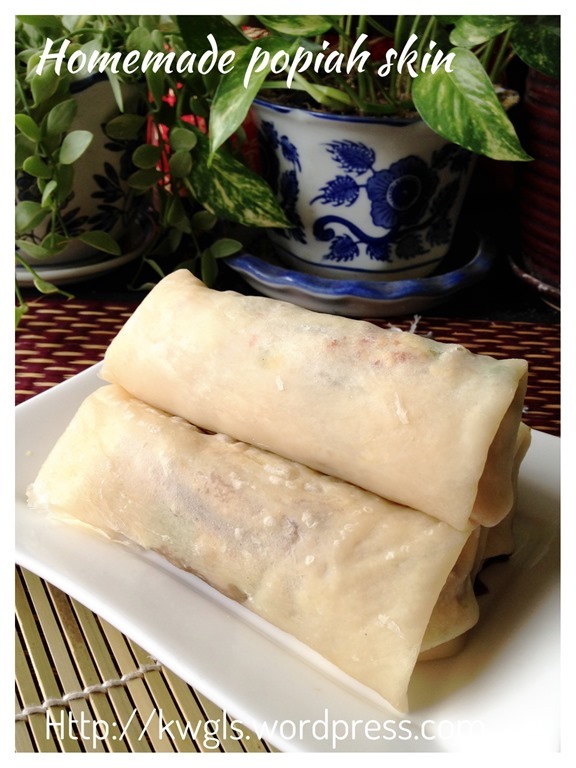 Singapore and West Malaysian Popiah appeared to be the Hokkien version of popiah originated from Xiamen, China, jicama and cabbage were julienned and cooked over slow fire in prawn stock or plain water until they are very soft. When wrapping, people used fork or other kitchen utensils to press against the cooked jicama for purposes of squeezing the water out before wrapping using the rice crepes. For dry version, no cabbage was used and jicamas were usually julienned into thicker stripes. It was then sprinkled with some salt to “force” the water out using the principle of osmosis. After that, it will be fried together with other ingredients. 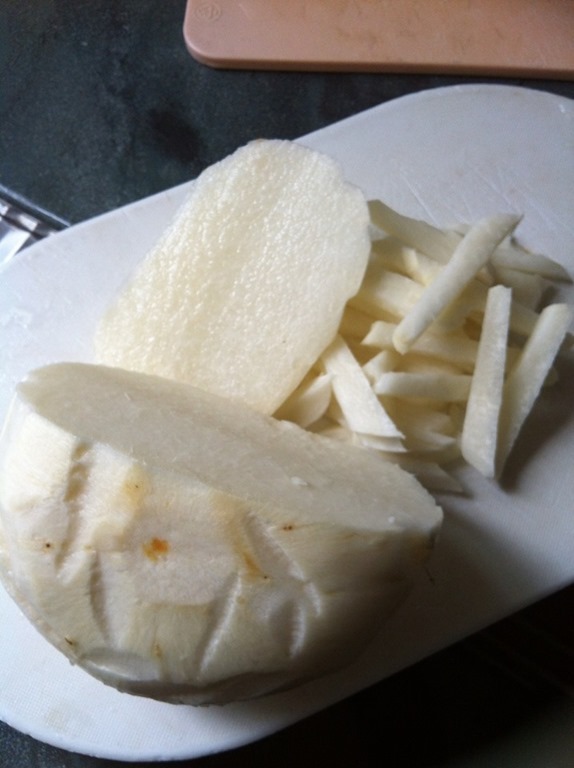 One thing to note is that the jicama when julienned, should not be too fine. Other wise, your fried fillings will be too soggy for wrapping. Cleaning of lettuce and coriander. Use some clean cloth to dry the lettuce and flatten it. Therefore, from the above, the process of preparing of raw material is laborious and it would be tough for one person to shoulder all the responsibilities of preparing all the ingredients by one self. In old time, such preparation process is actually a “come and help” social gathering whereby usually lady guests will come earlier and help with the preparation of the raw ingredients and the man would come after all the popiahs were wrapped! 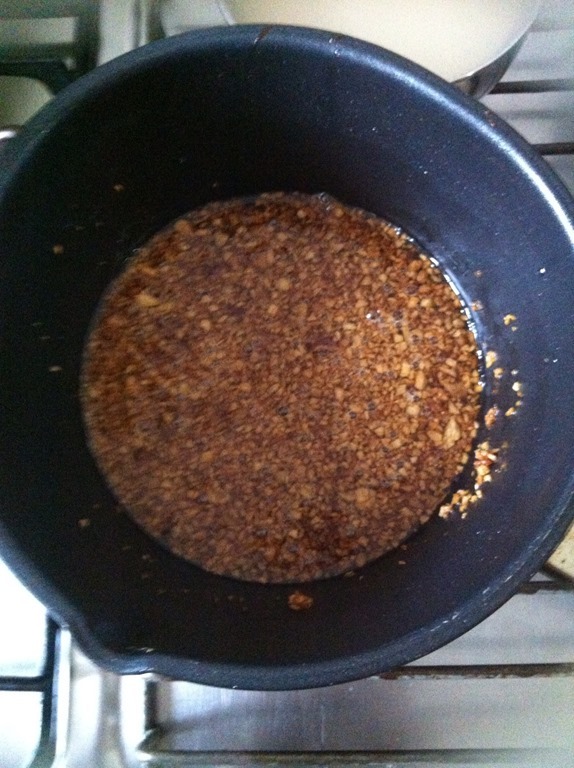 Fried some minced garlics and onion until brown, sieved and set aside for later use. 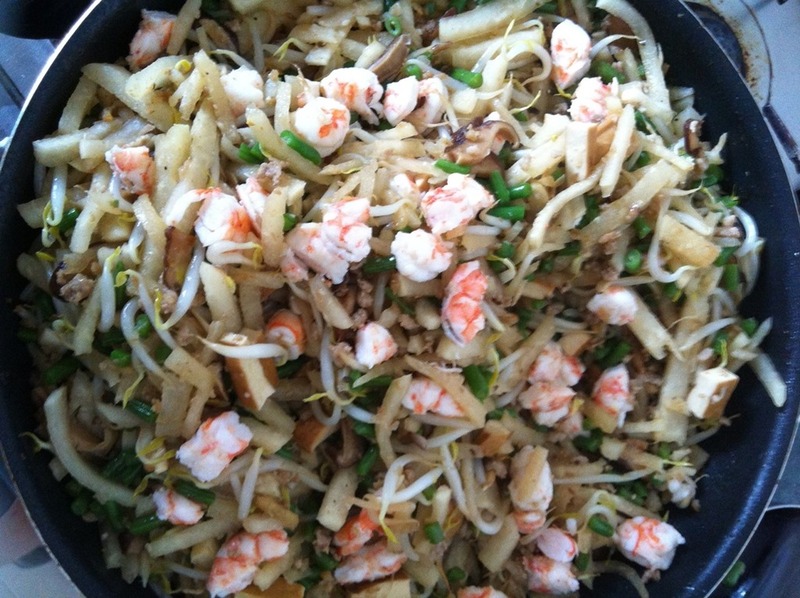 Stir fried minced garlics and onion, dry prawns and mushrooms until the fragrant comes out. At this stage, I usually add some condiments such as pepper and salt at this stage. 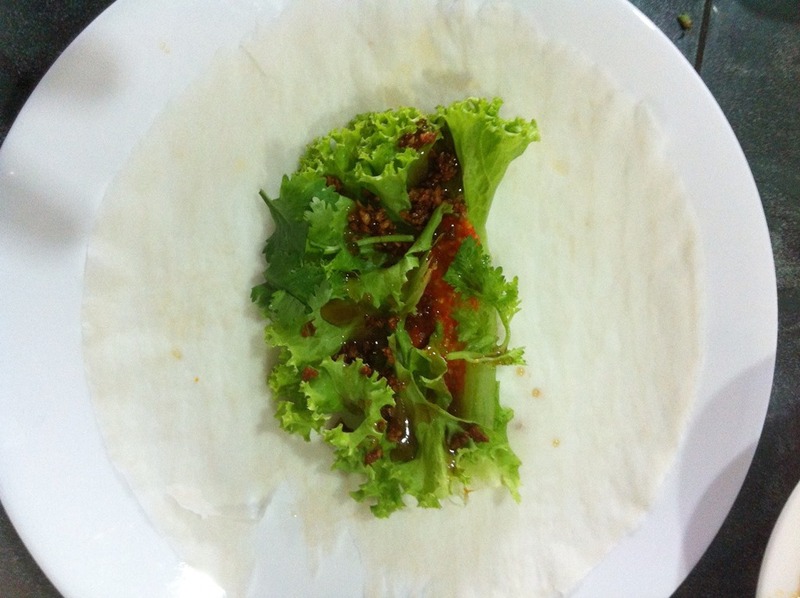 Throw in the minced pork belly, French beans, dried tofu (in this order) one by one until the pork belly is 70% cooked. Add the jicama and bean sprouts and fried until you see the jicama start to get soft (which is very fast). I have to caution against that jicama should not be over cooked other wise it will be soggy. 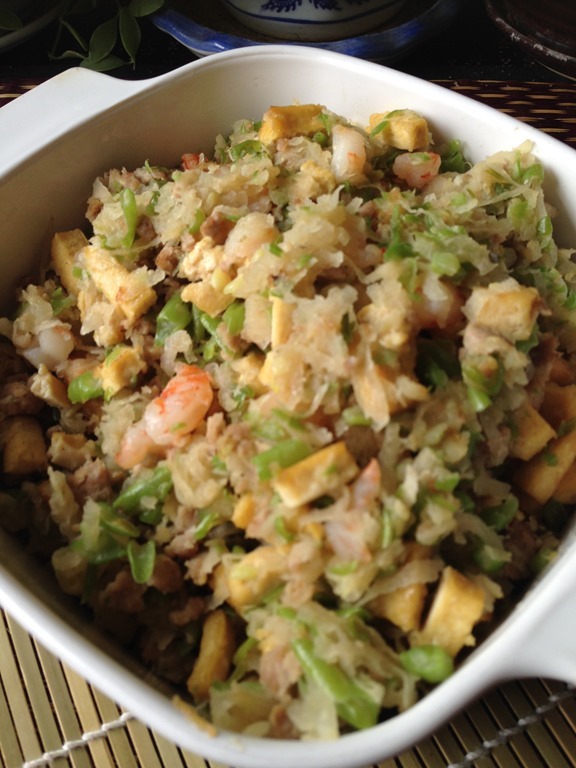 Mixed the blanched prawns, add additional condiments to taste and you are done. You should have a rather dry filling. 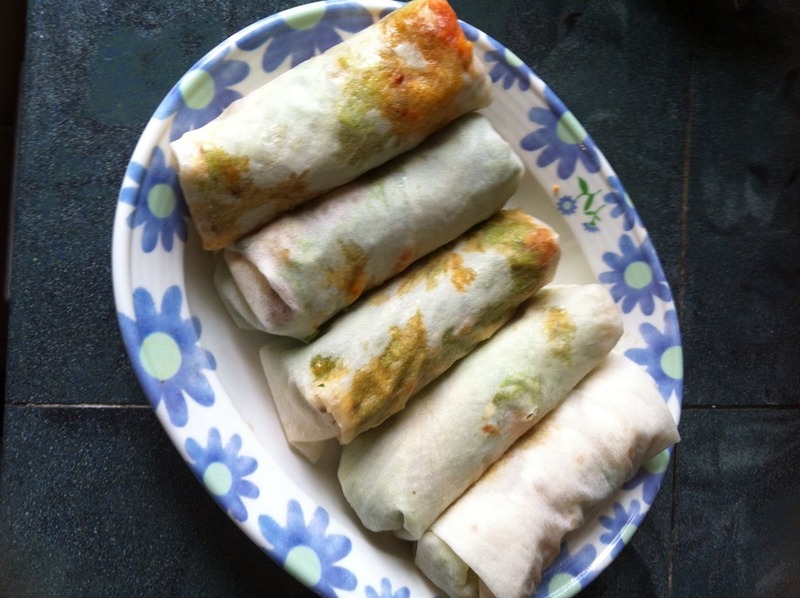 Lay one Popiah skin on the table, put a leaf of “flattened” fresh lettuce, put some deep fried garlics and spread some sweet sauces and chillies on the lettuce. It is wise to spread this fix ins on the lettuce because this will prevent liquids penetrating the skin making the skin too soggy for wrapping. 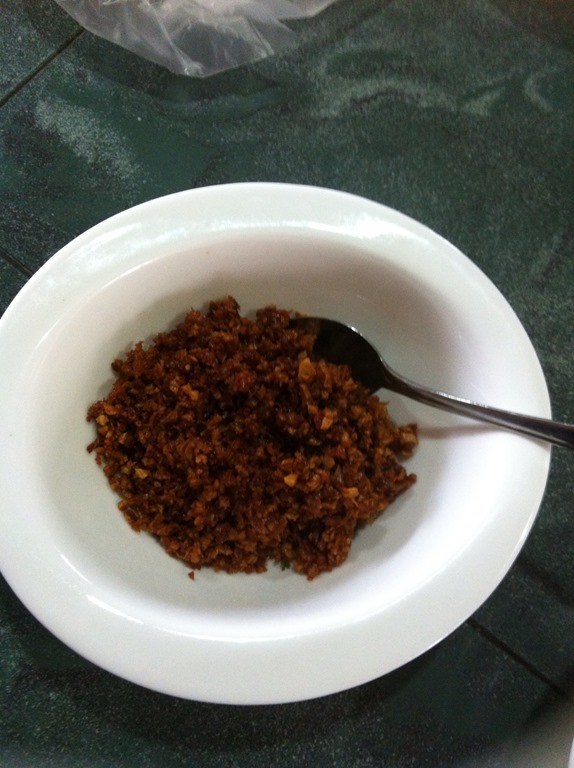 Put some sweet sauce on top followed by some groundnut powder. Note, I only put sweet sauce at this junction, again, I want to let the sweet sauce penetrate the filling and collected by the lettuce. 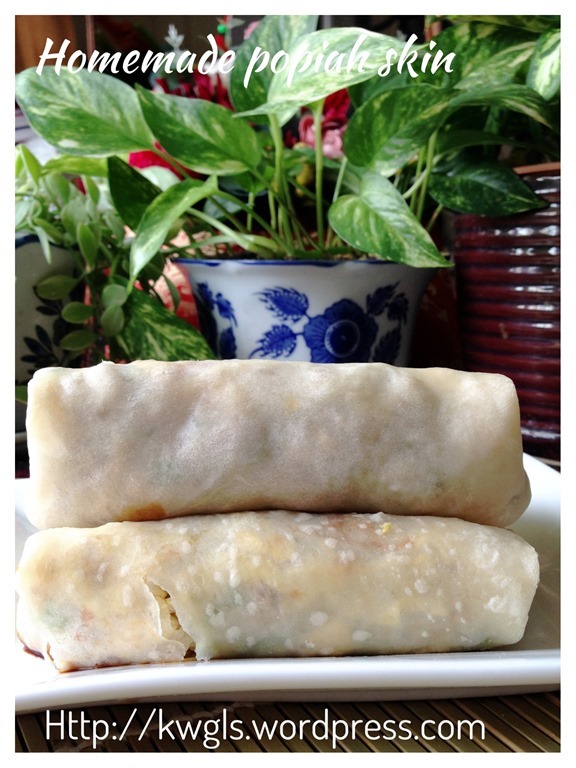 Fold the spring rolls and open your mouth to eat….smile. Serving of the dry version is usually not cut into small pieces. As it is dry, you can just take one and popped into your month without utilizing any spoon and plates. In older days, it was wrapped with a piece of white paper to facilitate your holding and prevent juices coming out of the filling. If you cannot finish it, you can just wrap it and store in the fridge. 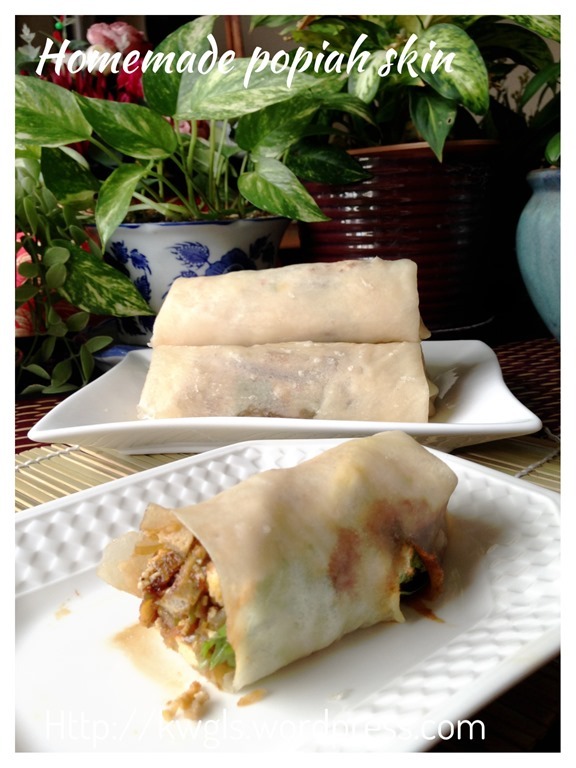 The next day, just fried it and it will become fried spring roll. If the skin is too damp, since it is frying, you can add another skin. 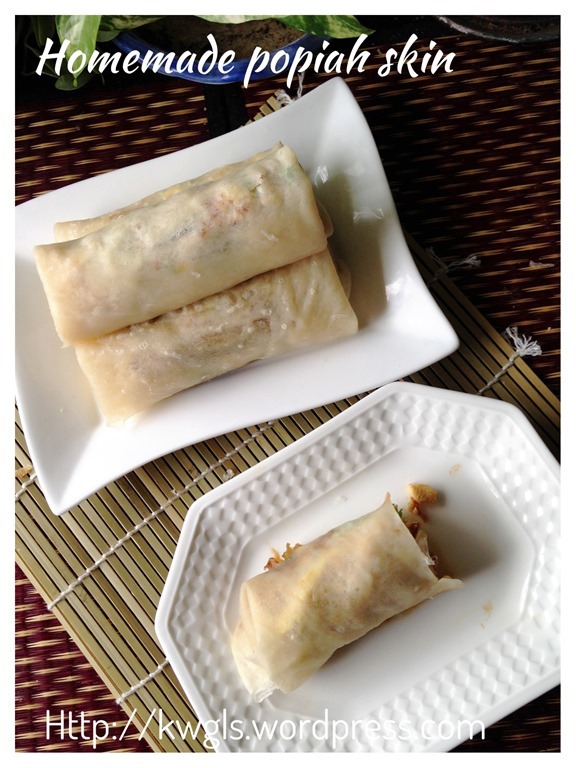 Alternatively, you can store you left over filling in the fridge and wrap it the next day before frying or consider making the Kueh Pie Tee. 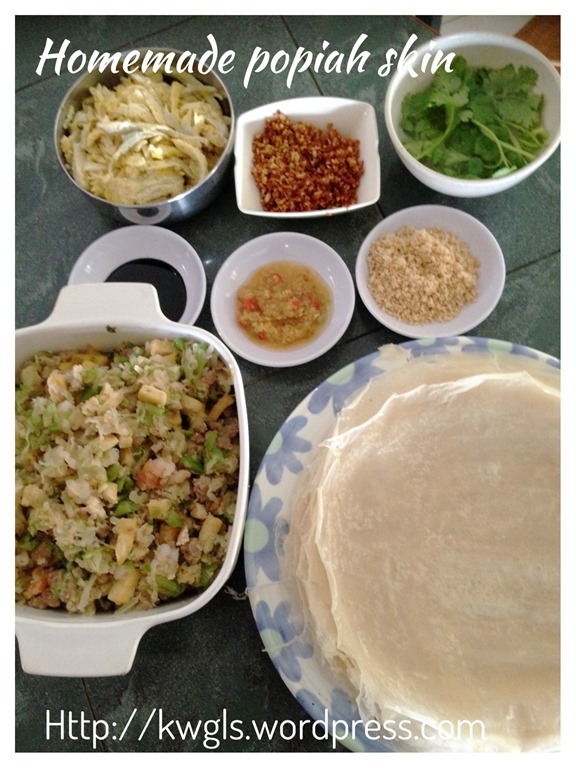 You can have as many variants of popiah as possible but in my humble opinion, the following ingredients should not be substituted to make it to taste like popiah: taukwa, jicama, French beans, beansprouts, grounded peanuts and sweet sauce. 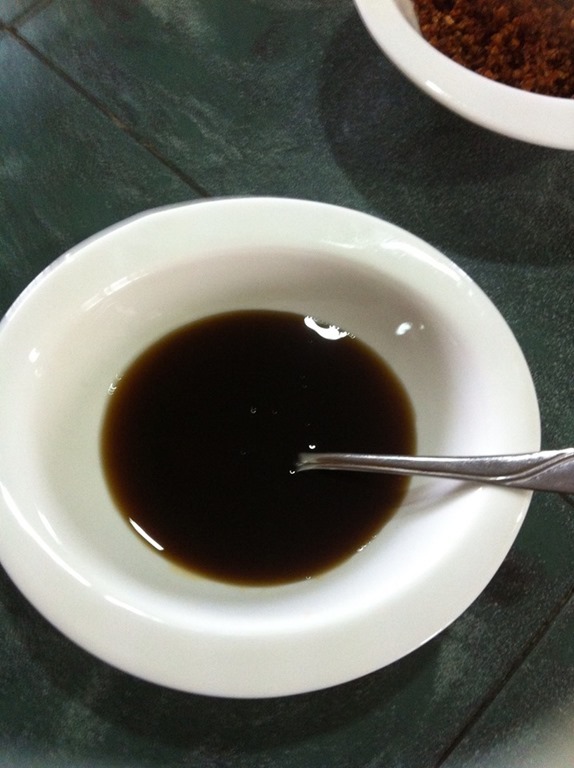 This entry was posted in Chinese and Asian Cakes and Snacks, Food Preparation Series and tagged 8, CHINESE, Chinese meals, delicacies, 薄饼, food, GUAI SHU SHU, Guaishushu, kenneth goh, kuching, malaysia, POPIAH, postaday, sarawak, sARAWAK POPIAH, singapore. Bookmark the permalink. This is amazing, so much work but they look delicious!